In the Survey window, choose whether to use analysis results to create or update a survey, or to use an existing survey. In Insight, a 2D survey is a collection of related 2D lines. Every line is defined by a set of tie points that associate common midpoints (CMP) to eastings and northings (X/Y). If two SEG-Y files have the same CMP to X/Y tie points, then they sit on the same survey line. Create new survey called: Create a new survey in the project for this line geometry. Enter a name for the new survey. Use existing survey: Use the line geometry from an existing 2D survey in the project. Use this option when loading related data on the same lines. Tie points are displayed but are not editable. Add to/edit existing survey: Add the line geometry to an existing 2D survey. New lines are added to the survey. Existing line geometry is replaced with the new tie points. Note: Specify new line names to avoid replacing existing geometry. The geometry will be written to the new line names. Set a tolerance level (m) to simplify lines. Insight only requires tie points when the line changes direction or spacing, and unnecessary tie points can make some operations slower. This setting removes points within this distance from the simplified line. Click the Plus button to add an empty tie point row. Click the Minus button to remove a tie point row. For SEG-Y and/or navigation file that contain(s) both CMP and shotpoint (SP), define the SP-to-CMP mapping using the CMPs/SPs relationship calculator (see below). Enter 2 CMPs and shotpoint values and click OK.
Click Assign Missing CMPs/SPs and any missing CMP/SP numbers will be generated using this relationship. If you have selected the option to calculate the tie points from the X/Y headers, you will see the tie points that have been automatically calculated by the SEG-Y Loader. Change the values of the tie points by typing the values in the CMP, SP, X and Y columns. Click Reset tie points to reset the values to the automatically calculated tie points or to remove the manually entered tie values . The calculator automatically finds the relationship between two CMP / SP points. Enter two CMP values and their corresponding shotpoint values. The relationship between CMP and shotpoint is shown. This warning indicates that you're trying to import a line that has nearly or exactly the same survey definition as another line. This is almost never what you want. These three files contain different data for the same 2D line, and should be loaded separately. The line name should be "A15000", and not "A15000-NEAR". The "Select 2D SEG-Y Files" window tries to read the line name from the SEG-Y header, but not all files contain this information. This warning occurs when any segments of the line have CMP spacings less than 2 metres or greater than 50 metres (6 - 164 ft). Such spacings are unlikely to occur in seismic surveys. It’s more likely that the X/Y headers are not mapped correctly, or require scaling. X/Y values are commonly multiplied or divided by 10 or 100 and If the file is written properly, this should be automatically applied. Unfortunately, not all SEG-Y files follow the standard and this scalar may need to be applied manually on the "Specify the byte locations of headers" page. The lines are different, but were given the same name. This may be a user mistake, an error in the SEG-Y file, or a poor guess by the name-detecting algorithm. Update the line name in the "Select 2D SEG-Y Files" window. The lines are the same, but one or both were loaded with the wrong X/Y header mappings or different scaling. 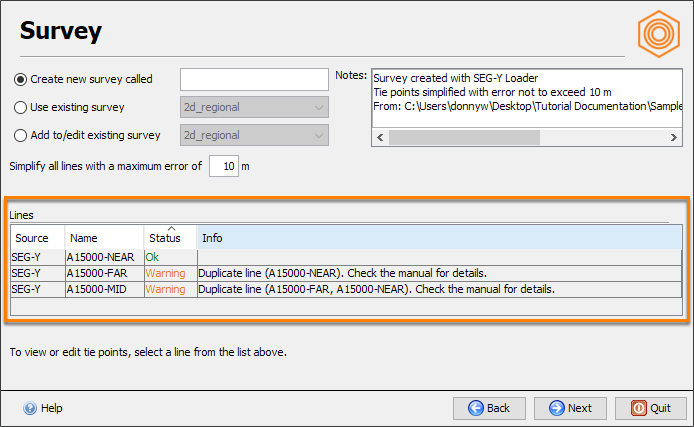 Confirm the header mappings and scaling are correct on the "Specify the byte locations of headers" page. The lines are the same, but the X/Y coordinates have been transformed using different coordinate reference systems. Coordinate conversion is configured on the "Specify the byte locations of headers" page. In these cases, the software cannot determine whether the existing survey or the new SEG-Y file has the correct coordinates. A surveyor's report or overview map may be the way to confirm which is correct.